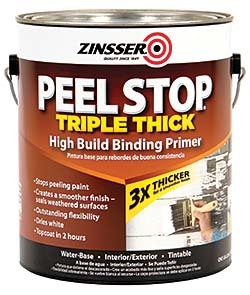 Zinsser® Peel Stop® triple-thick, high-build binding primer is an interior/exterior primer specially formulated to lock down peeling paint and seal weathered surfaces. Offering three times the thickness of regular primers, it penetrates to seal, fill, and level worn and weathered substrates to provide a more uniform surface for the topcoat with a smoother finish. It is designed for interior or exterior surfaces, such as previously painted wood siding, windows, baseboards, trim, doors and fences. It also can be used to lock down peeling paint on metal gutters and downspouts, concrete, PVC, plastic, plywood, brick, stucco, masonry, aluminum, aluminum siding, galvanized steel, and fiberglass.